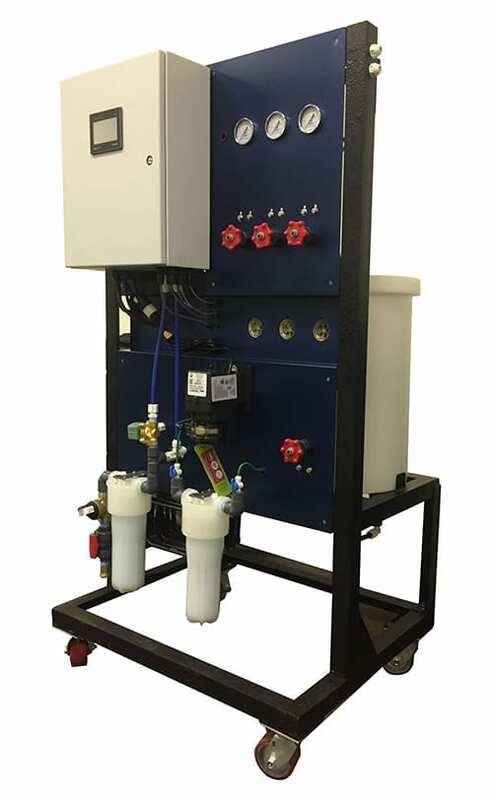 Commercial Mixed Oxidant Generators - ChlorKing, Inc.
ChlorKing®’s line of NEW-GEN Mixed oxidant generators offers a new and exciting method of sanitizing water for a number of applications, including animal drinking water, food preparation, fruit washing, carpet cleaning and many more. NEW-GEN generators are available in many sizes and configurations to suit any application and are capable of producing up to 2.4gpm of solution. Anolyte – Produced with a pH of 2-7, free chlorine of 250 – 700ppm and an ORP of +950mv, this solution is a very effective sanitizer and multipurpose cleaner. N.E.W (neutral electrolyzed water) – Produced with a pH of 6.5 – 7.5, free chlorine of 250 – 700ppm and an ORP of +950mv, this solution is used in potable water treatment, bio-film removal in circulation piping and bacteria removal in storage tanks. N.E.W is fast becoming one of the most sought-after solutions in many industries, and its true potential is still being discovered.